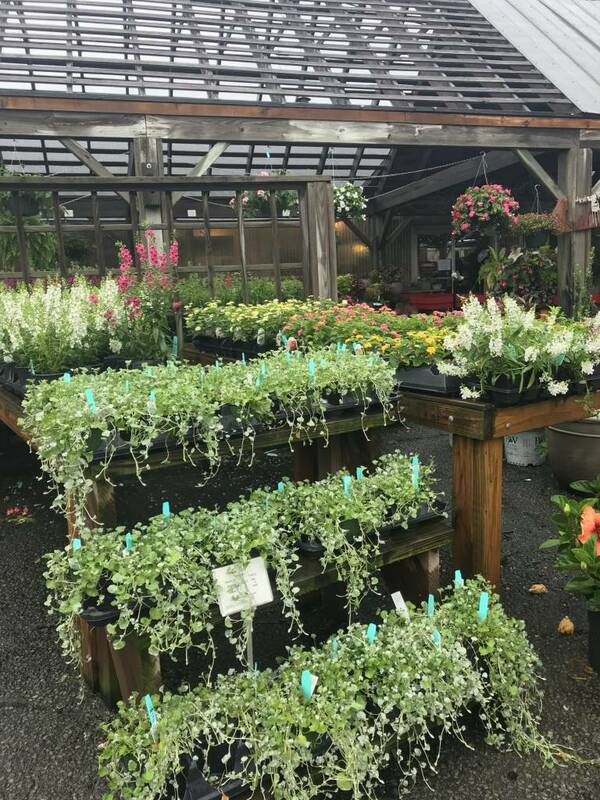 Snapshots of the Nursery In June…It’s Not Too Late For Flowers! One cloudy morning right before a deluge of rain, the light was finally right to take a few pictures of the nursery. Usually the light is too bright, or we’re busy unloading trucks, helping customers, filling orders, and generally running around. I’m certain the shots here would be better with a great camera (These are IPhone pictures. ), but this gives you an idea of the amount of material still available, fresh plants from local growers ready to take on the midsummer heat. 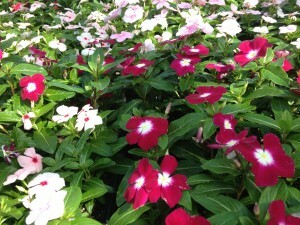 Some of the best annuals for summer planting and filling in tough spots are vinca. 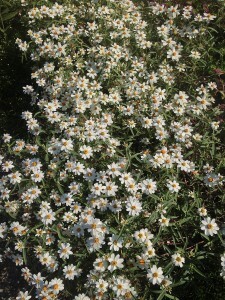 They come in a range of colors and once established are extremely drought tolerant. Trailing varieties are also available. Upright pentas are another workhorse of the summer and are butterfly favorites too. This is another that hybridizers have improved upon each year, and one that also has a trailing version, perfect for sunny containers. We still have a selection of caladiums too, and the majority of them will tolerate sun as well as brighten shady spots in the garden. 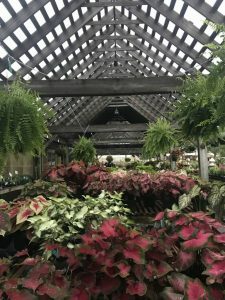 If you’ve ever looked at your garden beds and seen nothing but little leaves and a few blooms, caladiums might be just the thing to add that interesting and colorful foliage element to your design. This year there’s a new begonia called ‘Canary Wing’ that’s been fun to play with in mixed containers, but it would also be stunning as a single specimen in a pot or massed in a shady garden bed. The red blooms on this large begonia contrast beautifully with the bright yellow leaves. As you walk through the nursery, you’ll see a myriad of other choices including angelonia, a great bedding plant for sun. It’s best used in masses, and the spiky blooms add visual contrast when used with other blooming plants like lantana and vinca in sunny spots. Silver dichondra adds its silvery sheen to plantings, cascading down the side of pots, over walls and between plantings. It’s a tough plant and drought tolerant too. 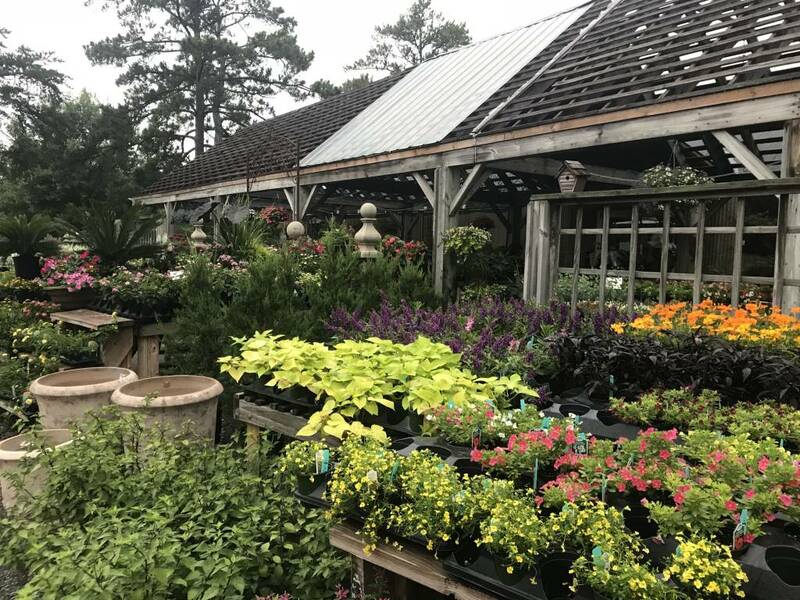 So, if you simply need a few fill-in flowers or have a larger area that still needs planting, we have plenty of healthy and beautiful choices for your garden. 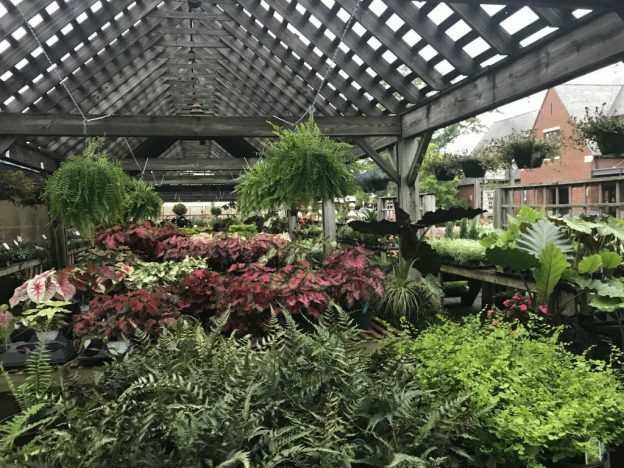 And, while you’re here, take a browse through the perennials and herbs and stroll through the greenhouse as well! 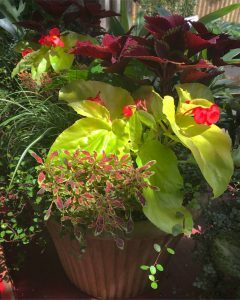 This entry was posted in Annuals, Bedding Plants, Flowers, Gardening Tips, Summer and tagged angelonia, begonias, caladiums, lantana, pentas, summer in the nursery, vinca on June 24, 2018 by Kris Blevons. 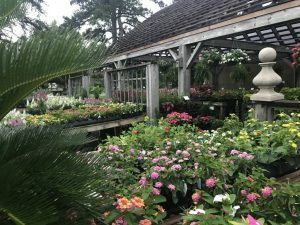 Annuals And Perennials – What’s The Difference? Annual: one of those go-to plants that you put out each year – for example in your planters – (annually) a geranium, or begonia perhaps. 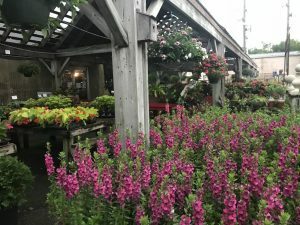 Annuals give you a lot of bang for your buck in one fell swoop – but, when they’ve exhausted their blooming period, they are finished, kaput, done. This also applies to fall plants such as pansies and violas. We call them cool season annuals because their blooming period – (before they’re finished, kaput, done,) is the cool season, or winter. 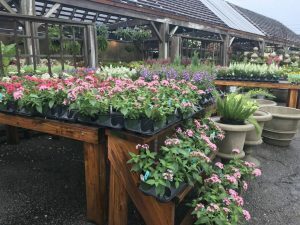 Cool season annuals just can’t take the heat, so when they’ve given it up we plant out summer annuals – think zinnias, begonias, caladiums, coleus, fan flower…all the pretty plants we buy in our frenzy of spring fever. So, maybe that helps a little bit? 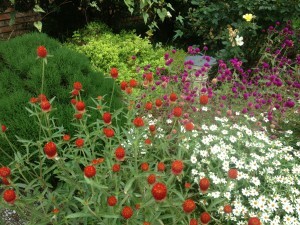 Put another way, you plant annuals in the Birmingham area annually (each year – spring and fall.) 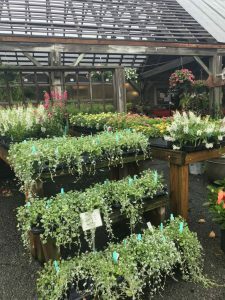 Some annuals for spring/summer planting become available early in the spring and others show up a bit later and really need the heat turned up to do well. Annuals also provide lasting color – useful for the long summer season…typically, annuals in the Birmingham area begin to play out and look “tired” by mid-August though, even with the best of care. August is one tough month! 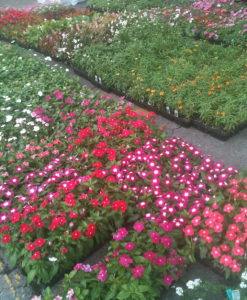 Here’s a small sampling of some great annuals for Birmingham and surrounding areas – this is just the tip of the iceburg, however. For more inspiration, check out our Facebook page too, or better yet, stop in! Dragonwing begonias – sun or shade, with adequate water they get huge! 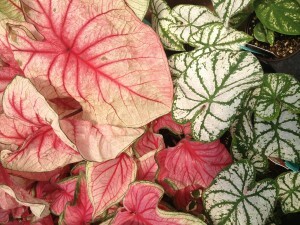 Caladiums – traditional shade plant, now many selections are available for sun too. 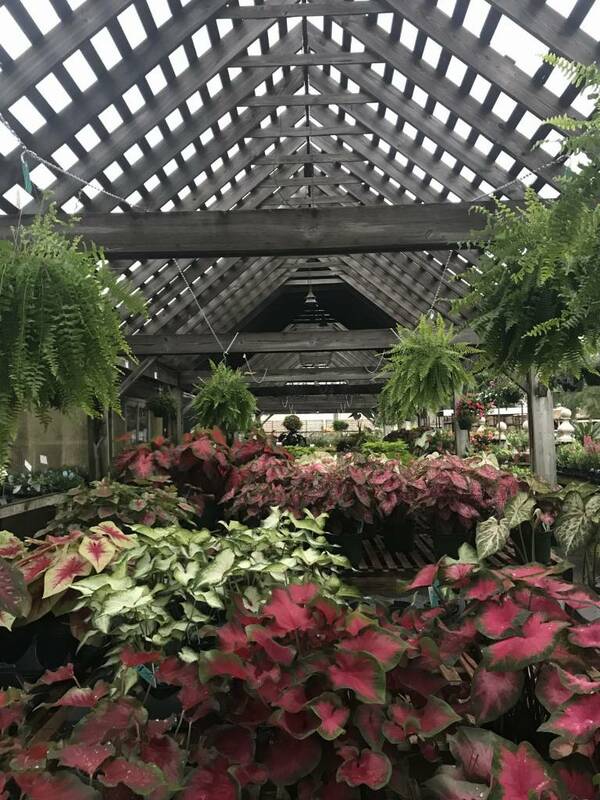 Pretty mixed with asparagus or other ferns, begonias, Sunpatiens, torenia or any other flowering annual that compliments the color of their leaves. They’ll do best if you wait to plant in garden beds until the ground is warm, usually by May. Coleus – beautiful colors! Another that used to play only in the shade, now many varieties are used in full sun plantings. 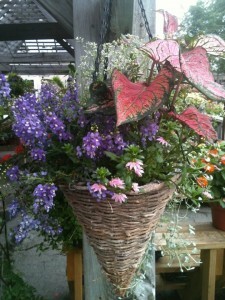 Very useful as an accent foliage in beds or containers, they can get very large! It’s quite easy to keep them at whatever size you’d like, though. Simply pinch when young or cut them back if they get out of hand! Check the tag for sun tolerance. Gomphrena – This one may not be familiar to you. 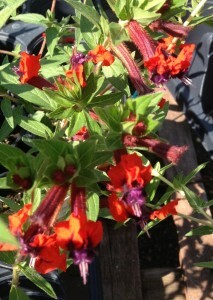 A heat lover, it has globes of purple, orange or sometimes pink flowers, and is long lasting and tough. It never looks like much in a pot so you’ll have to trust us on this one – but if you do, you won’t be sorry …and they’ll still look good in August! 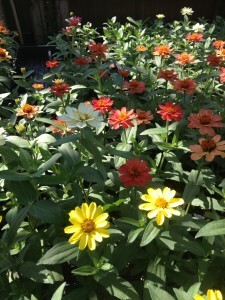 Zinnias – There are many varieties of zinnia from the tiny flowered narrow leaf zinnia to the more open Profusion and Zahara zinnias, and they all love the heat. Don’t be afraid to cut them back if they become rangy mid-summer. If you do, they’ll also still be looking good in the latter part of the season. Vinca – this one is the absolute easiest, most fool proof annual to use for a lot of color in hot spots. Plant them and don’t baby them with too much water. They’ll reward you with loads of pretty blooms in clear colors. There’s also a trailing vinca as well. 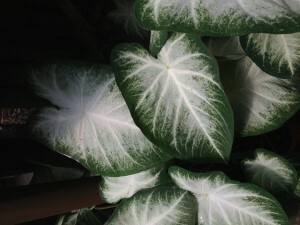 As with caladiums, don’t plant too early in the ground. 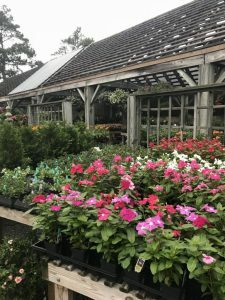 Sunpatiens and New Guinea impatiens – these are the types of impatiens that are resistant to downy mildew which is affecting bedding plant and double impatiens in our area. They are only available in larger pots, but you don’t need as many of them since you can space them further apart in your beds. In containers they make quite a show too! Pentas – the butterflies love pentas and these come in so many colors. Bright red, white, light and dark pink, lilac – there’s a color for everyone! 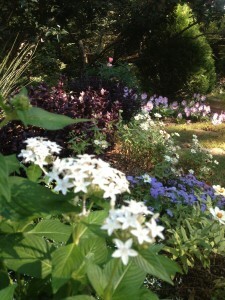 To maintain pentas, you need only keep them deadheaded – keeping the old blooms cut off. If you haven’t tried these, you’re in for a treat! 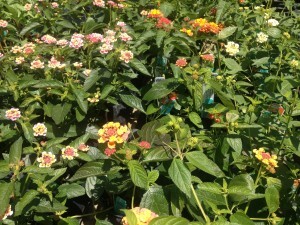 Lantana – The old stand-by for sun and heat. There are many good selections of lantana now and growth habit varies – some will get enormous, (tall and wide) while others will stay more mounding and compact, so always check the tag for size. Particularly nice for planters are the trailing varieties which come in bright yellow, white and lavender. They take a while to take off, but once the heat sets in they spread like crazy! 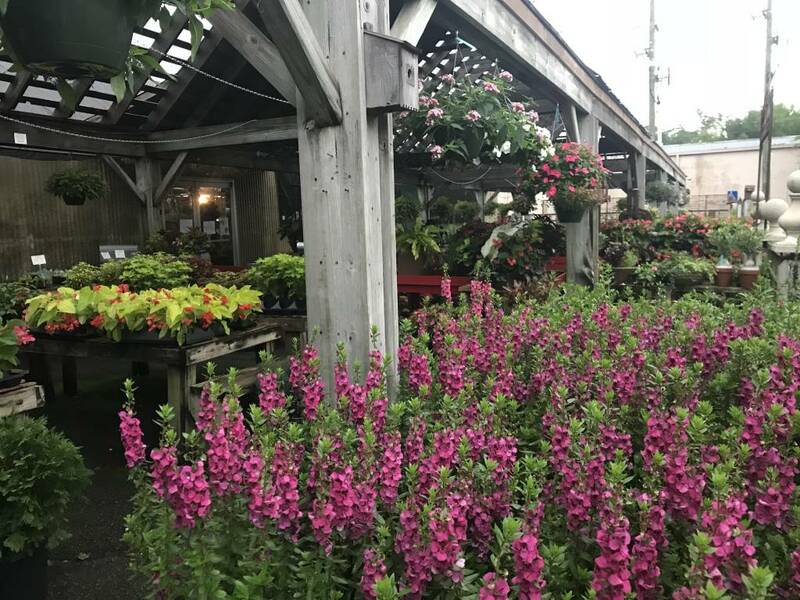 Angelonia – Sometimes called summer snapdragon because of the shape of the bloom, angelonia is a good choice to add some height in beds and containers. Strongly upright in growth, but loose enough to not look stiff, it’s a welcome addition to our summer plant palette. 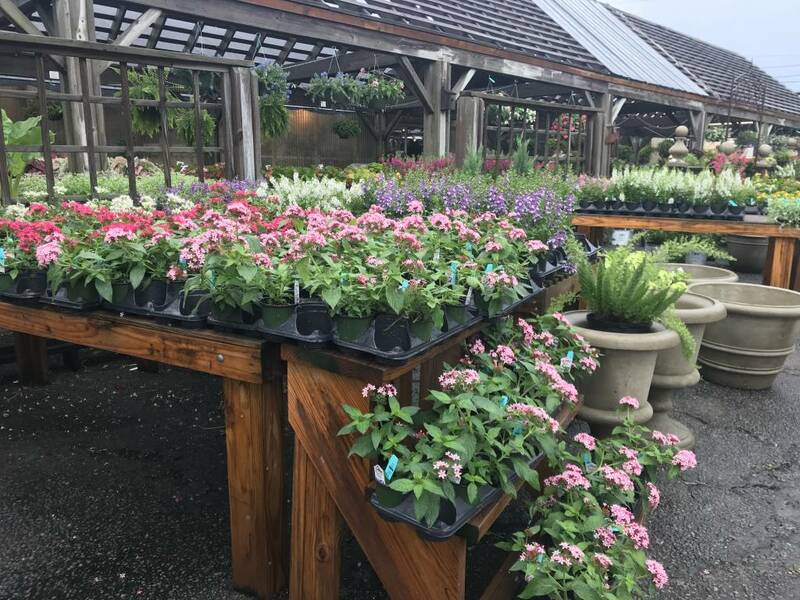 Hybridizers have been working overtime improving color, bloom size and heat tolerance, making these beauties one of the newer go-to plants for summer plantings, adding shades of purple, pink, lilac and white. 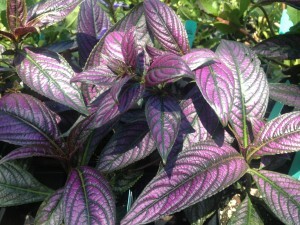 Strobilanthes/Persian Shield – This foliage plant is an excellent annual, like the caladium, that is useful as a foliage accent in plantings. In the ground or in pots, it is gorgeous! 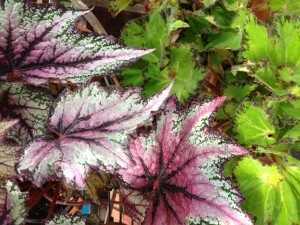 Rex Begonias – Another great foliage accent in many leaf patterns. Good for shade planters primarily. Technically a houseplant, but I couldn’t resist putting another foliage option in this post! We’ll discuss perennials (they’re the ones that come back if they’re in their happy spot.) in a future post. Meantime, maybe there are one or two annuals on this list you haven’t tried – maybe it’s time! 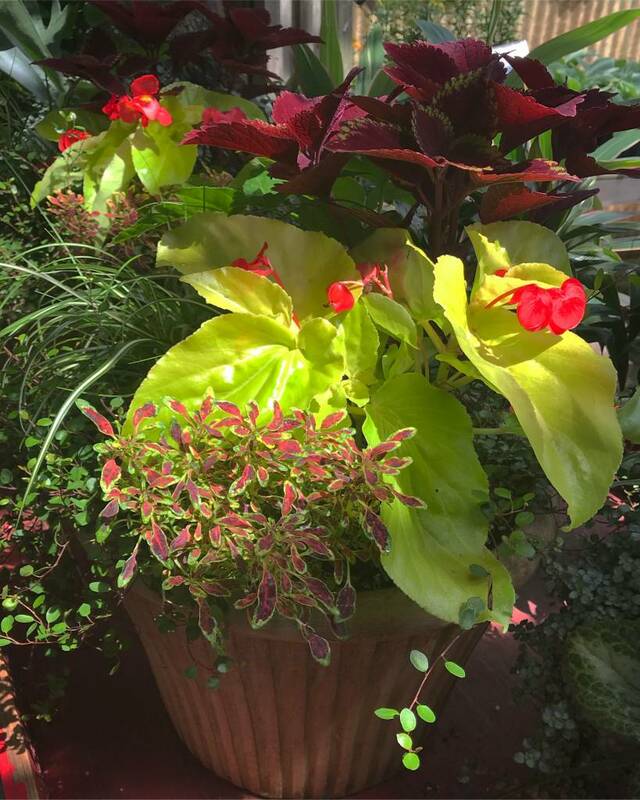 This entry was posted in Annuals, Uncategorized and tagged annual, begonia, caladiums, color, dragonwing begonias, geranium, gomphrena, lantana, new guinea impatiens, pentas, planters, summer plants, sunpatiens, torenia, vinca, zinnias on April 29, 2013 by Kris Blevons.